I saw your post on the parking situation at the state house, and agree that the surface parking is an eyesore, like it is almost everywhere else around Providence. So I was bored after class today and photoshopped an aerial image of the RI State House that could get rid of the surface lots, still keeping in mind that most people commuting will drive to work. Got rid of the surface lots, and feel a parking garage with a nice facade/metal screen, lighting and shops on the first floor could go on the fourth side(blank side) of the odd postmodern plaza in the middle of all the state offices. Creating a nice courtyard between all the buildings. I like the idea of combining a parking structure with ground floor retail uses on the State House complex grounds. There really is no good place in the immediate area to get a bite to eat or a cup of coffee for state employees or visitors. Retail at a garage could help that, and the central plaza could become a good place for workers and visitors to enjoy thier lunch. Well, there’s already a big cafeteria in the DOA building. I used to eat lunch there on occasion when I worked in the State House. You’d need an 8 to 10 level garage to accommodate all the parking for the state. It would have to be right next to the State House because deity forbid a legislator has to cross Smith St. I’d say build it right next to the State House where the current parking is located. 8 levels at 100 cars per level might do the trick. That’s 800 vehicles. I really like this submission, and feel especially proud to have sparked so much conversation on this subject. It shows how various parking types affect the cost of an apartment, when added to a building. It’s not an exact science extrapolating from there for something like a State House, but it helps to give a general view of what different types of parking cost. This concerns me as it affects the Brown plan to tear down some historic houses between Thayer and Brook and put in apartments with underground parking. Underground parking spots can run in the six figures per spot. I know that sounds crazy, but it’s a lot of excavation, and building, and lighting, etc., so student housing of that kind, in addition to destroying historic buildings, would also be very pricey. And then, if you’re planning that housing, or the complex at the State House, you end up in a situation where you have a strong disincentive to cut employee car commuting, because that’s the only way you’d be able to make back the huge investment. That’s the main reason I propose leaving the current surface lot, but gradually cutting it in size. Even if no one changed modes of transportation after the initial 10% reduction, the spillover could likely be absorbed by on-street spots. Having people park on-street would be the most ideal solution in the long-term, because part of the reason that neighborhoods built around state capital complexes (or stadiums, or other one-off-use areas) get so dead around them is that people park right where they’re going and don’t leave except by car (hence, no swanky restaurant scene across from the capital). Again, though, while I think all that’s important to consider, the overall direction of the above post is really inspiring, and I hope that more things like it come from around the city. In my view there is already a massive parking garage right there– at the mall. Just take away the spots. The Statehouse is fortunate enough to be ideally situated to the train and quite close to KP. Closing that distance effectively is key to a future public transit system which sensible treats Providence as a destination, rather than prioritizing commutes to Boston. I like the idea of doing it bit by bit. Stop the folks from driving there who are doing it because of some perceived convenience but really could be equally well serviced by transit and expand use over time. Here’s a question about the mall garage, which keeps coming up in this discussion. Since I work during normal business hours (like everyone else), I am never in the mall during these times during the week. How full is the garage now? I would (1) think that would be a TERRIBLE idea if those spaces are used by others and (2) expect the state to have to pay for whatever spaces it takes as that would be a loss to whoever runs that garage. With their own parking facility, the state is able to allow public use of the spaces when the General Assembly is not in session. But in the mall, I would half expect the signs to always read “parking for state employees only” because they wouldn’t be able to control those spaces when the GA is in long or oddly timed sessions like they can with their own lots that have guards or gates at the entrance. There’s also the issue of the distance. I know it’s not far. You know it’s not far, but it’s up a pretty good sized hill if you work in the state offices on the north side of Smith St. They’d likely need a shuttle to run between the offices and the mall, which is an added cost. I really like the idea of a garage with ground floor retail, but I’d want the garage on Smith St. It would give the legislators what they want (to be able to park next door) and put the retail in a place that actually sees more foot, bicycle, and automobile traffic than State St. If you need more spaces, add a smaller parking structure to State St. But to counter what Tony is saying, having 800 spaces is like giving ALL the employees a space, which isn’t necessary, IMO. You also don’t have to have a ton of public spaces. In fact, I’d probably suggest having only handicap spaces for the public at the state offices and forcing the rest of us to park on the street or in the mall… or perhaps have a reasonable number of spaces in the garage that you have to pay to use. And, realistically, I don’t think there are currently 800 parking spaces in those lots, but, admittedly, I am not good at estimating parking spaces. The idea of “cashing in” parking came up before, and I think that a State House garage would be an excellent place to test the idea out. Yes, 800 spaces is probably more or less equivalent to exactly one space for every employee. So why not simply assign all employees each one space, and then allow them to “cash in” that space – forfeiting their free parking, but receiving back the sum total of whatever it would cost Joe Public to occupy that parking space for a month. Perhaps include an extra 100 spaces of public parking in the garage as a starting point, and as more people “cash in” their assigned spaces, shuffle the remaining assignments to provide for additional floors or floor sections for public parking rather than having one or two free spaces scattered throughout the complex. Come to think of it, do the Omni Providence and the Residences Providence have dedicated parking? If not, some traffic from those establishments may be finding its way into the mall garages as well. As a clarification, is “cashing in” different for you than “cashing out”? I envision cashing out as meaning that parking is free but that you get money for not using it. I would see “cashing in” as being a little different–no free parking at all, and you have to pay for your spot. A subtle difference, but I think that people would react differently to one than the other. James, I prefer the sound of “cashing in” to “cashing out” – and while my cashing in refers to the same thing as your cashing out, I think the subtle difference in people’s reaction would stem entirely from word choice rather than any minor difference in how the process of taking some amount of cash over a free parking space actually plays out. “Cashing in” does have that extra pizzazz of sounding like you’ve hit the lottery. I like your proposal, but not the part about the extra 100 spots. I do think that if a garage was built, that the State House could and should seek to lower its employee rate of driving by trading off spaces to other businesses. But adding 100 spots makes the parking crisis that Jef illustrated with his map worse. There is the complication that most private parking (that is, not state-owned parking lots or on-street) will be difficult to make people charge for. A lot of parking exists because cities make it exist. They require in their zoning. Businesses who are used to thinking that they need parking will resist reducing their lots. People who were required to build an expensive lot when they didn’t want one will also resent being forced to make people pay for parking and/or removing parking. So, ultimately, while adding 100 garage spots could in theory be traded for 100 private lot spots being removed, with the added bonus of internalizing the cost of parking to drivers instead of treating it like a commons, I worry that what would actually happen is that no other parking would disappear to balance those new spots, and that maybe the garage would even have trouble getting filled sometimes when people go for the free spots instead. If we have 800 spots now, we should aim for 10-20% fewer spots in the new garage (either 640 or 720). The abundant free parking all around should be able to absorb some drivers in a worst case scenario, but I think that with the incentives to carpool, bus-ride, or bike, that that also might not be necessary. Definitely a yes on any street-level businesses, if there’s a garage. I think the garage is also complicated because, as I said, it’s expensive. It’s going to cost probably $10 Million. At least. I still favor the lot reduction approach because it costs close to nothing, requires very little study, is reversible–which makes people more open to experimentation–and doesn’t carry the risk of being caught in bureaucracy. As far as mall parking, I would be willing to guess that a lot of peak shopping and peak work hour parking does not overlap. It’s worth studying. I think that it might be possible to have the mall absorb parking if the state is willing to work out a deal with them. The mall is also probably a place that could take more non-car transportation. 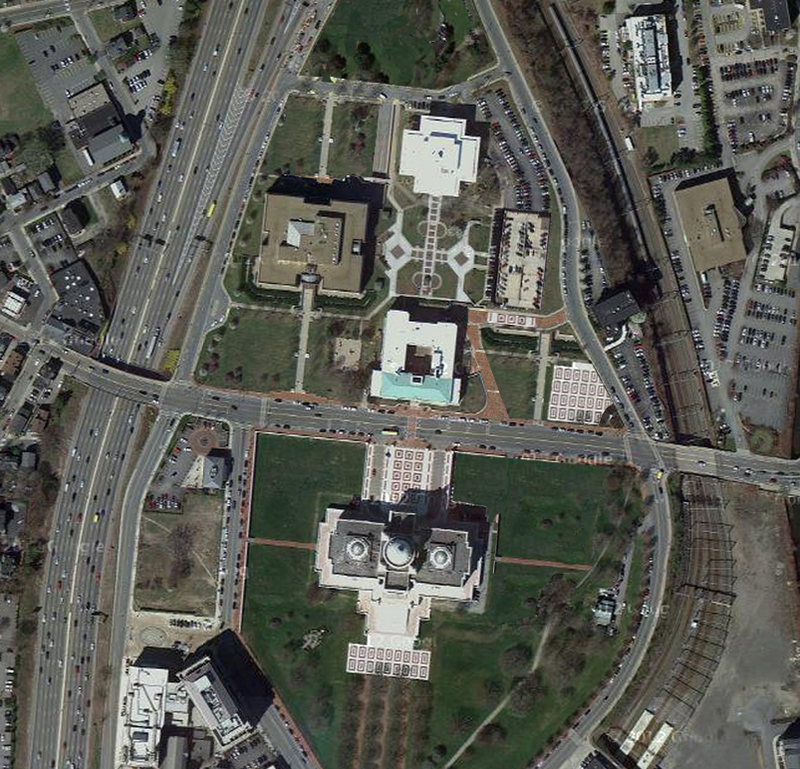 It is near Kennedy Plaza, the train station, and a future bike path, and if the state worked with the mall area to better transportation as part of a Capital Improvement District, the spots that exist could be used by people who really need to drive, while the rest of us could make the switch. The mall in Center City Philadelphia is over a train station, and it’s full of people without–to my knowledge at least–any parking garage dedicated to it. Peak shopping and peak work would have to be studied over the course of the entire year. I’d be willing to bet that between Thanksgiving and the first Sunday after New Year’s, the mall garage approaches capacity. I’m not saying it’s all shoppers, but to take up that many spaces for the state employees when they have plenty of property for ample parking, even if we remove some of it, would be a kick in the nuts to the mall. If people started going to the mall and finding out that garage was full, they’d get on the highway and drive north, south, or east for 15 minutes and do their shopping at Emerald Square, Swansea, or Warwick. I’m all for reducing the spaces, but I don’t think the state should be taking resources from elsewhere to do it. Just dig up a lot and start there. Removing parking from the mall to get people think outside their cars is a terrible idea. Removing free parking from the state house to get state employees to think outside their cars is a great idea. James, yes, there’s a potential that building a new garage won’t result in other surface parking being eliminated – but I think we need to take that chance. While eliminating 10% to 15% of the current parking does sound great, I’m leery of the potential backlash – not only are you sacrificing public access (and potentially revenue from public drivers) on day 1 and going forward until there’s enough spaces cashed in to result in a floor’s worth of driving, but you’re also no longer making the “cash in” process strictly optional – 10% to 15% of the people currently parking are going to have to cash in because there’s no longer any available space. Now, long term, I think we can eliminate that parking. We can build the garage in a modular fashion so that no-longer-needed floors can be removed later, or we can steadily start drawing down on municipal/surface lots as enough room in our garage is freed up to consolidate our parking needs there. I don’t even doubt that we might not be starting on the parking draw down within a year or two – but I think setting our day 1 goal at 10% removal is putting the cart before the horse and exposing ourselves to unnecessary amounts of push back. I think 800 spots may be pushing it a bit. i can’t imagine every state house employee has a car, or that they use it everyday. i think 500 spaces, with a retail floor would be a good idea, with the option of adding a floor or two if needed in the future (it can be done if you plan the the structure in a way that allows future changes). they can assign the floors like they do in hospitals where one floor i for visitors, one floor is for high ranking employees, another is for interns and so on. that would be more sensible. Could you expand on the modular aspect of your plan? How do you propose that floors of a parking garage would be removed? What do you estimate the cost would be? Where has this type of plan been tried and worked before? James, I envision a garage that’s essentially a stack of precast parking floors one on top of another on top of another. We could have, say, ten of these “floors” ready to go at any time to the point where installing them, or removing them, is as simple as disconnecting them from the rest of the structure and sending them off to wherever we would store such things. Ideally, we’d have multiple garages using this technology, so that as the parking demand at one garage evaporates but increases at another garage, you remove a floor from the less-used garage and install it into the more heavily used garage instead. The benefits of such a system are that adding and dropping precast floors to such a modular garage should cost a lot less than constructing (or destroying) a floor every time that needs to happen, and adding or removing precast floors is also far less permanent than creating or destroying floors in a fixed garage as long as you have somewhere to store them. Another benefit that would only apply to such a garage built in a seasonal location is that you can scale up or down in accordance to seasonal demand – say, at a university. Incoming freshmen? Add two floors. Graduation was last week? Drop two floors. Obviously, because such a thing hasn’t been done before, there’s no example I can point to of it working. The main drawbacks, besides the cost and risk associated with rolling out any new technology, is that the places where we most could have used this technology (among Wickford Junction’s many crimes, there was an awful lot of hype about maxing out the garage we have there already and needing to add additional floors – but, in fact, the top two floors are blocked off due to low demand, and we can’t just get rid of them) already have garages and retrofitting for a modular construction would be extremely difficult. Still, Kingston’s Amtrak station regularly overflows its parking. There’s idle talk of building a garage there. Combined with the potential to trade in surface parking for a Smith Hill garage, we already have two excellent candidates for a modular garage that even have a clear and desirable direction in which we want to see the parking move – as more parking is needed at Kingston to accomodate ridership growth and less is needed at Smith Hill as more and more state workers opt for transit instead of driving, the floors would disappear from the Smith Hill garage and be added to the Kingston garage. As a proof of concept, I think it’s worth pursuing. I will provide a major caveat that I think it will be extremely important to run extensive cost-benefit analysis as part of pursuing the concept of a modular garage. There is a chance that it would be too expensive to construct or store a series of precast parking floors. It would also be bad if the physics don’t work out – one potential concern would be if the precast floors settled and became stuck in place (perhaps due to the immense weight placed on them by an entire floor of parked cars? ), thereby rendering the entire thing a pointless waste of time and effort! I’m not saying that we can do it, just that it might be something worth looking at doing. I would support experimentation with anything, ultimately, but I think going with a simpler plan first is wiser, in terms of saving us lots of opposition. Remember, the original plan I propose doesn’t even permanently remove asphalt from the parking lot, in its first stage. It just allows people to put raised beds on 10% of the lot. So in the initial phase, if people said they were nervous about what would happen, you could just reply that it’s as simple as moving some raised beds if it doesn’t work. I think I just prefer something that has fewer ifs. Oh, as a side note, I didn’t catch the part of the comments that said that removing parking from the mall was a horrible idea at first, or I misread it. Just to clarify, I wasn’t saying that we should remove that parking. I was only saying that when there is a compliment of good transit and bike infrastructure, there is no ipso-facto relationship between good business and parking being available for people. The parking that’s there probably could support that whole corridor if RIPTA stepped up its game, and if State House employees had the cash-in. I am glad that my photoshop render could continue the discussion! Just trying to get rid of surface parking one small step at a time. Whenever, I go into Providence, I personally never have a problem with finding parking on the street or parking at the mall, Providence is such a compact and walkable city, although I understand this is a problem in the wintertime. I have never had to use one of the thousands of surface parkings lots that dot the city’s landscape. However I have not been back in a while and did not work in Providence when I lived in Rhode Island, I could imagine parking needs would change drastically during the work week.